This article by Mike Ludwig is re-posted from EcoWatch. The bitter battle over fracking has gone global, and according to pro-business consultants, the oil and gas industry has every reason to be concerned. Oil and gas rigs are popping up in communities across the world as the fossil fuels industry races to exploit reserves with the controversial drilling technique known as fracking. In response, a global anti-fracking movement has emerged, and activists are winning victories in countries across world. A report recently released by the international consulting group Control Risks warns the oil and gas industry that it has underestimated the “sophistication, reach and influence” of the global anti-fracking movement. The report contends the opposition is not simply a spotty, not-in-my-backyard phenomenon “masquerading as environmentalism,” but a diverse and well-organized coalition that is unlikely to be swayed by the industry’s well-funded public relation campaigns. The report’s findings may come as no surprise to activists. The grassroots anti-fracking movement spread “organically” across the world as drilling continued to expand and spark controversy in new areas, according to the Control Risks report. Online social networking, rising media coverage and widespread distribution of Josh Fox‘s controversial 2010 documentary Gasland has stimulated the movement, and now there are hundreds of anti-fracking groups in the U.S., Canada, Australia and countries across Africa and Europe. The global anti-fracking movement may be grassroots in nature, but communities and activists across the world share the same concerns about the “significant” impacts of fracking, according to Mark Schlosberg, an anti-fracking organizer with the U.S.-based group Food & Water Watch. Environmentalists and drilling opponents say fracking threatens to drain and contaminate local water supplies, cause air pollution, industrialize pristine rural areas and contribute to global warming. “The issues people are facing in different parts of the world are the [same] issues that people are facing in the U.S.,” Schlosberg said. Schlosberg said fracking directly affects those living near the rigs, but climate change and dependence on fossil fuels affects everyone. Recent studies that fracking operations can release considerable amounts of methane, a greenhouse gas, and concerns over global warming have united climate change activists with the global anti-fracking movement. In many parts of the world, activists also are pushing the industry to invest locally and provide better economic compensation to the communities where drilling is taking place, according to the Control Risks report. The most significant “risk” posed by the anti-fracking movement is bans and moratoriums on drilling, according to Control Risks. In France, fracking was banned indefinitely in 2011 after significant public outcry, and the French government reaffirmed the ban in September 2012. Food & Water Watch, which supports a national ban on fracking in the U.S., has tracked 308 local measures to address fracking in municipalities across the nation. Some communities banned fracking altogether, while others put limits on fracking activity or symbolically endorsed statewide bans. Public outcry also has pushed some governments to conduct safety reviews of fracking that could pave the way for tighter regulations. Under orders from Congress, the U.S. Environmental Protection Agency (EPA) is currently conducting a study on fracking and its potential impacts on water supplies. The agency recently released a progress report, but a final report will not be released until 2014. 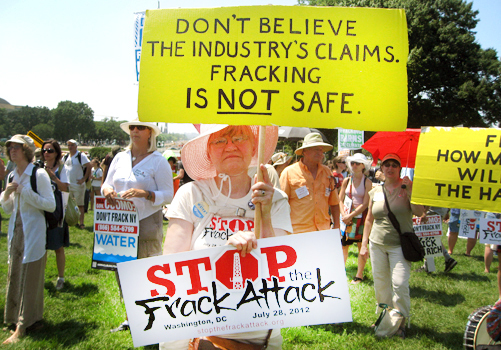 Meanwhile, fracking is rapidly expanding across much of the U.S. with little federal regulatory oversight. The industry also should be wary of radical and direct action activists, according to Control Risks. Activists have peacefully blockaded fracking sites in the U.S., Canada, Australia and Poland as direct action-oriented environmental groups like Earth First! rally opposition to fracking. Isolated acts of minor vandalism and sabotage to drilling equipment also have been reported in the U.S. and Poland. “They would not have commissioned this report if they didn’t think the anti-fracking movement was effective,” Schlosberg said. Control Risks spokesman Chris Levy told Truthout the company released the report to attract the fracking industry to its consulting services. The firm helps companies and large industries manage “hostile environments” and threats to international business ranging from anti-corruption investigations to anti-industry activism, kidnappings, maritime piracy and even terrorism, according to the firm’s website. “As for the supposed successes that opponents have had, I think they’re pretty much limited to headlines and maybe an uptick in their fundraising efforts, because they really haven’t stopped the industry from drilling wells,” said Everley, who added that fracking is creating jobs across the country and expanding domestic energy production. The Control Risks report advises the industry to quell the opposition by reforming its practices. Instead of flatly denying any wrongdoing and accusing reported fracking victims of spreading “fear” and “hysteria,” fracking companies should acknowledge the negative impacts of drilling and the grievances of those impacted, like residents who believe their water supplies have been contaminated. Frackers also should put more resources toward protecting the environment and disclose the chemicals they pump into the ground during drilling, the report said. Activists in the U.S. have fought for such disclosure for years. Control Risks also suggests that simply telling the public that drilling will lower energy prices is not enough to gain support, and the industry should “create more winners” in the communities where fracking occurs. Drilling firms should invest in communities by buying local supplies, hiring and training local workers and paying all required taxes. Most crucially, drillers should make long-term local investments to ensure sustained economic benefits to communities, even after drilling is complete. Schlosberg, however, said environmentalists and anti-fracking activists want long-term solutions to the world’s dependence on fossil fuels, not simple reforms offered by an already wealthy industry. Activists, he said, must remain “very vigilant, mobilized and organized” as the industry wakes up to the reality of the global anti-fracking movement. ← Will Calvin College Play Host to Fake Ex-Terrorist Kamal Saleem…Again?